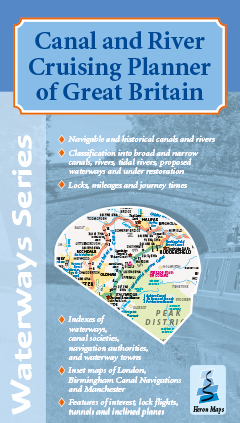 This cruise planner is the perfect companion to our individual waterways maps showing the entire waterway network of Great Britain. A double sided folded map of Great Britain's entire waterway network at 1:660,000 scale, ideal for cruise planning. It shows all navigable canals and rivers clearly distinguishing between broad and narrow canals and tidal and non-tidal rivers. There are inset maps of Birmingham Canal Navigations, London and Manchester shown at 1:150,000 scale. Along with navigable waterways the map shows historical ones, those undergoing restoration and proposed new ones. The navigable network is annotated with information about distances, numbers of locks, approximate cruising times, tunnel locations and flights of locks, all useful when planning a cruise. Notable waterway features of interest are also shown. This is complimented with a comprehensive index of waterways including the organisations responible for each waterway, as well as contact information for national waterways organisations and an index of waterways places. The Canal and River Cruising Planner of Great Britain is available to buy online or by telephone from our business partner, Guidepost. Click on the logo below to visit their store.